PRICE POLICY FOR KHARIF CROPS: THE MARKETING SEASON 2017-18 - Dilli Chalo! 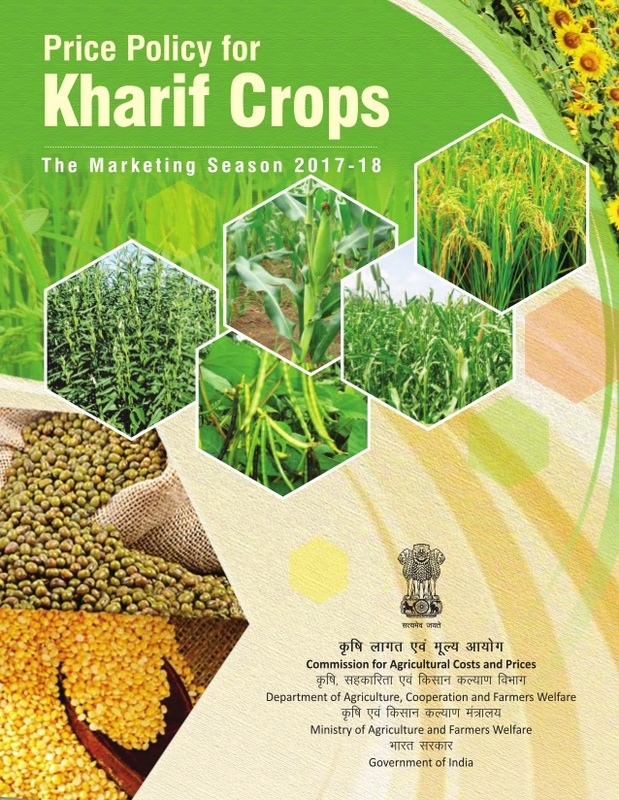 This report, by the Commission for Agricultural Costs and Prices (CACP), provides price recommendations and non-price measures for mandated kharif crops for the 2017-18 market season. The CACP, set up in 1965, was originally called the Agricultural Prices Commission but was given its present name in 1985. It prescribes the minimum support price (MSP) for 23 agricultural commodities to the government. These include 7 cereals, 5 pulses, 7 oilseeds and 4 commercial crops. CACP is attached to the Ministry of Agriculture and Farmers Welfare, Government of India. In order to arrive at the MSP, the CACP takes into account factors such as cost of production, the overall demand-supply situation, domestic and international prices, changes in input costs, inter-crop price parity, terms of trade, efficient use of resources, and the impact of MSPs on price levels. The report furnishes most of its data in tables, graphs and charts. The minimum support prices (MSPs) for kharif crops in 2017-18 are given in Table 6.1. It also mentions the MSP for the kharif market seasons of 2015-16 and 2016-17. According to the report, Indian agriculture was likely to register a growth of 4.4 per cent in Gross Value Added (or what farmers make before sale) in 2016-17. The production of food grains was estimated to increase by 272 million tonnes in 2016-17, with kharif ­­­crops at 137.5 million tonnes. The Commission recommended that the government initiate a special programme called ‘Bridging the Yield Gap’ to improve crop output and productivity growth rates of many crops. It would involve the participation of farmers, researchers and extension agencies. The CACP said that declining public investment in agriculture needed to be reversed urgently. A scheme of interest subvention could be extended to investment credit in order to make term loans attractive to farmers. To improve soil health and crop productivity, the CACP suggested balancing the use of primary nutrients and addressing the deficiency of secondary and micro-nutrients. It also suggested that urea prices be increased and a higher subsidy be given for P and K fertilisers. Farmers had to face many risks, including bad weather, pests, wild animals and changing market prices. The Pradhan Mantri Fasal Bima Yojana (PMFBY) aimed to provide farmers insurance in case of crop failure, but crop damage by wild animals still needed to be addressed. The rational pricing of irrigation water and power was needed to encourage farmers to adopt water-efficient practices like drip and sprinkler irrigation, which would also help in crop diversification. To increase the domestic production of oilseeds, the Commission suggested a cess of 0.25-0.50 per cent on the import of edible oils. This would help create an ‘Oilseed Development Fund’ that would be managed by the ministry. Since marginal and small farmers could not invest in large machinery, CACP said farm mechanisation must be promoted through Custom Hiring Centres (CHCs). These centres would be established through public-private partnerships, by private entrepreneurs, co-operatives, farmers’ organisations or charitable trusts. The production of extra-long staple cotton varieties (grown in some areas of Tamil Nadu and Karnataka) needed to be encouraged because they fetched high prices. This could increase farmers’ incomes and reduce imports. The government procurement of rice increased from 32.16 million tonnes in 2014-15 to 34.22 million tonnes in 2015-16. However, in major rice-producing states like Assam, Bihar, Uttar Pradesh and West Bengal, the procurement was very low. To make the price support more effective, CACP said procurement operations in these states must be strengthened. The Commission emphasised that the cultivation of pulses on rice fallows in eastern India, and as intercrops, should be given high priority. Pulses and legume oilseeds fixed nitrogen in the soil, and provided an important eco-service. Farmers, it said, should be given incentives of Rs. 1,800-2,700 per hectare to grow pulses. India achieved a record production of pulses in 2016-17, and market prices dropped below the MSP. So CACP asked for the removal of stock limits and licensing requirements for pulses. This would allow traders to freely buy, stock and sell pulses, and help to improve market prices. Factoids and Focus compiled by Kanika Gupta.